It can be tough to believe that a violent crime, major accident, or another traumatic event can happen on your property, but it’s possible. Situations that concern a death or serious injury are disturbing to come across. They become extremely dangerous to encounter as well if there’s blood and other biohazard materials at the scene. The first step you should take in such a scenario is to call emergency responders. Afterwards, be sure to contact a professional cleaning service to have your property restored, because EMTs and law enforcement officials won’t handle the cleanup. 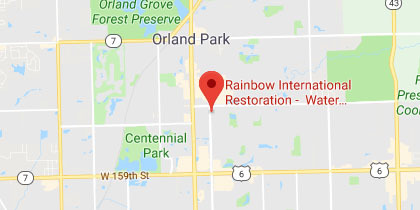 At Rainbow International Restoration of South & West Suburbs, we offer biohazard and trauma scene cleaning services to Orland Park, IL. With these services, we safely clean up scenes that have biohazard materials. 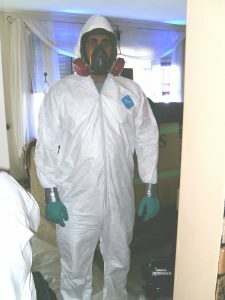 The technicians that we employ are experienced and certified to conduct biohazard cleaning and they have all passed background checks, so you can trust them to work in your home. We know that these situations can be tough for those involved, so we are always respectful when conducting our work. We will immediately come to your property to clean and restore the scene where the traumatic incident occurred. To protect your privacy, we arrive at your home in an unmarked vehicle and will be discreet with our work. Our technicians will get rid of all biohazard materials found on the scene: blood, tissues, and more. After removal, we clean and disinfect the scene to ensure no remnants of the biohazard materials are left behind. If a crime took place, we are prepared to collaborate with crime scene investigators, working without jeopardizing the ongoing investigation. When blood, bodily fluids, sewage, and other biohazard materials are cleaned and disposed, it needs to be done in accordance with CDC, EPA, and OSHA regulations. The professionals we employ have been trained to conduct cleanup and disposal of biohazard materials safely, following all local and federal regulations. In addition, our technicians have done extensive training to earn bloodborne pathogen certification. All of the biohazard materials that we remove from the scene are brought to a licensed medical waste facility so they can be disposed of properly. When your property is the site of a traumatic event, dealing with insurance is the last thing on your mind. Our professionals can help by advising whether to involve insurance. If it’s necessary, we’ll help file the claim and have the bill directly sent to your insurance company. We also offer price-matches to match any estimate from an IICRC-certified professional service. We know how traumatizing it can be to encounter or experience a major accident or violent crime on your property, especially when a death or injury is involved. But it is important to try to remain calm and make the proper calls. After you’ve notified emergency personnel of the situation, call Rainbow International Restoration of South & West Suburbs for our biohazard and trauma scene cleaning services in Orland Park, IL. We are respectful with our work and can be reached on a 24/7 basis at (708) 571-2550.